Nearly 40 percent of Rwanda’s population is between the ages of 14-35. Every year there are over 200,000 learners who enter upper secondary school and over 90,000 who enter technical and vocational education and training (TVET) schools. The small formal employment sector cannot absorb all of these graduates and youth unemployment is at 65 percent. 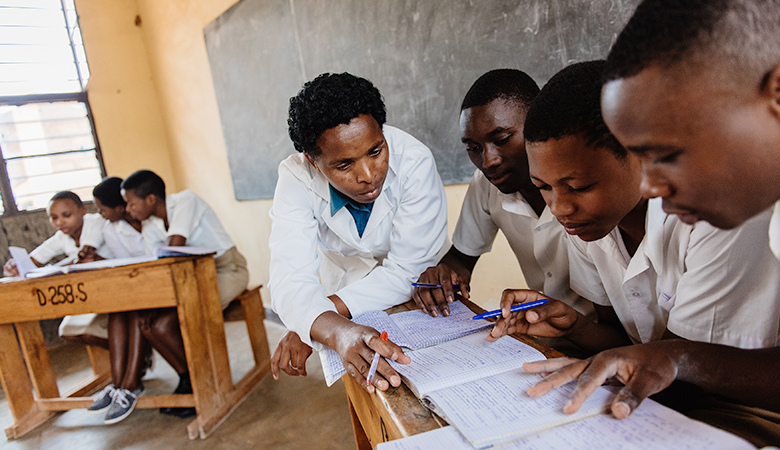 Through the Akazi Kanoze 2 (AK2) project, EDC is working with Rwanda’s Ministry of Education to help young people gain the knowledge, skills, and attitudes they need to participate in an expanding economy. At the center of AK2 is the implementation of EDC’s Work Ready Now! curriculum and school-to-work transition services in schools throughout the country. AK2 is a national scale up of the USAID-funded Akazi Kanoze project, begun in 2009, within Rwanda’s secondary education system. USAID continues the efforts at this scale through the USAID Huguka Dukore Akazi Kanoze project. Developed national curricula materials based on EDC's Work Ready Now! employability program. An impact evaluation of AK2 students found that AK2 youth are 8 percent more likely to be employed after graduating second school than those that do not participate the program. Young women who participate in AK2 are 12 percent more likely to be employed than women who do not participate. This cost analysis study of the Akazi Kanoze 2 work readiness program in Rwanda was carried out from October 2015 to October 2017. The results of this study aim to inform the relevant government ministries and its development partners about the required budgets to roll out the national work-readiness curriculum nationwide successfully, while maintaining adequate standards of quality and sustainability. This is the executive summary for the report that describes the results of a randomized controlled study of the Akazi Kanoze 2 workforce development program. The study, which involved more than 1,500 young people during Year 1 of the three-year program, showed the participants were 8 percent more likely to land jobs than youth who did not participate. This report summarizes the lessons learned and methodology developed in establishing work-based learning (WBL) in Rwandan schools. This work was done as part of Akazi Kanoze 2 (AK2) project to help participants access real, hands-on experience where they could practice and demonstrate the skills that employers have indicated they want most.